Last year I wrote about the OMS calculator that was just released. Now that the OMS licenses has changed, Microsoft updated the calculator and released a new version of it: http://aka.ms/omscalculator . It’s really easy to use, you just need to fill in the number of nodes (or computers) and select which OMS components you would like to use. A node can be a virtual machine, a physical server, a network device or other instance. You can buy additional nodes either upfront through a suite or by purchasing a pay-as-you-go plan. Node charges are calculated hourly and any nodes that report for only part of the month will be charged only for the timeframe they send data. A server that reports for 10 days in a month will be charged approximately 1/3rd of the price of the full month (based on 31 days). 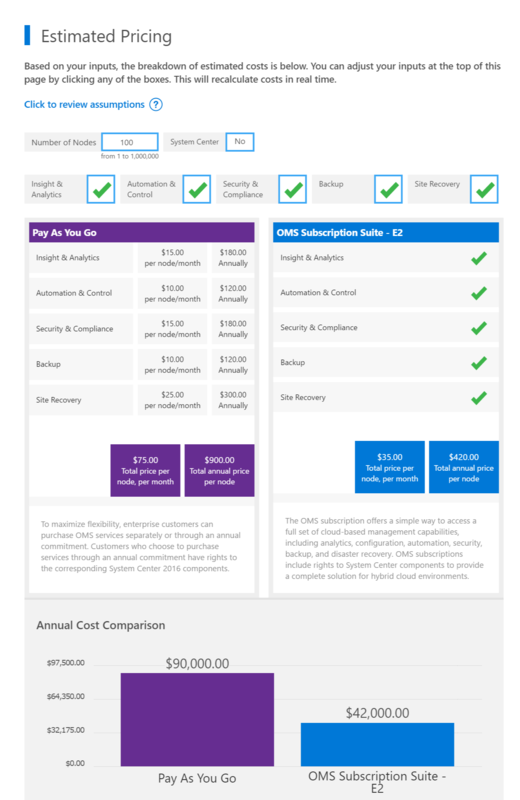 You can find more information about the new OMS licensing here: https://www.microsoft.com/en-us/cloud-platform/operations-management-suite-pricing. I’m not going into detail in this blogpost on how it the OMS licensing works, as it’s pretty complicated.